Lori comes to St. Anthony’s from a fifteen-year career in higher education, but is no stranger to retreat ministry. Specifically, she is no stranger to St. Anthony’s. The St. Anthony Retreat Center, as it was then known, was Lori’s placement site during her year of service with the Capuchin Franciscan Volunteer Corps of the Midwest (Cap Corps). As a resident volunteer, Lori spent the year helping in the front office, hosting retreats, leading the music at retreat liturgies, and learning how to live in community. 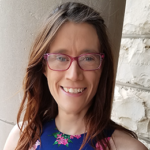 Since finishing her year of Cap Corps service and leaving St. Anthony’s in 1999, Lori has worked as a parish music director, a contract specialist for the state of Wisconsin, a retail sales clerk, a freelance editor and translator (German to English), and a professor. She has spent many hours biking, walking, or doing strength training; has managed to memorize the entire English two-letter Scrabble word list and much of the German two-letter word list; and has earned her ham radio license, but still can’t come to terms with Morse Code. She has lived in Wisconsin, Michigan, Ohio, Arizona, and Germany while pursuing graduate degrees in linguistics and education. All the while, she has strived to infuse her work and her relationships with the joy and spirit that she learned during her year with the Capuchins. She is delighted to bring that joy and spirit back to the place where it all began!